After game three, our party got sepearted, and sent in two different directions. For Interstellar Exports Game 4 we followed Dry as he secured his new prize -the S.S. Hornby- and stumbled through a couple of empty star systems. He was finally able to return to the Trans-Galactic Highway, and Ended up in System 0708: the Voodar System. 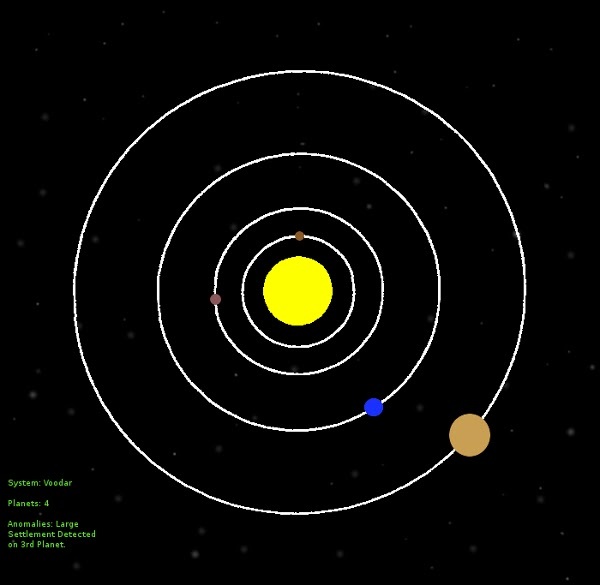 The Voodar System has four planets, but only one of them is considered habitable, so Dry set his course towards it; ignoring the other three planets. But of course in Interstellar Exports, there are Easter Eggs everywhere. The first planet in the Voodar System is the aptly named Voodar I. It is similar to the surface of Mars and uses Mars' surface for its map coincidentally. Despite its lifelessness, there is however, one anomaly across the iron red surface: the silver reflection of a Galactic Council Research Module. The module has a single inhabitant: a human archaeologist who is convinced that a powerful and advanced alien civilization once ruled Voodar I's. Voodar II is similar to Venus... And also uses a map of Venus. I was in rush to get this system finished... Give me a break. Despite the fact that almost anything will start to corrode within an hour of being on its surface, even the most rudimentary sensors can detect large amounts of valuable minerals beneath the planet's crust. Now I don't necessarily recommend it. However, you could probably get better results than I, for what that is worth. Anyways, Dry ended up getting shuttled to the large space port around the central city of Voodar III. From there he took one of his injured crewman to a hospital, and spent the rest of the time exploring the port. There he gained a new pilot Zeila Dakdon and was ready to fly the stars again. Voodar IV is... Yeah that's Jupiter. Nothing particularly remarkable there. I guess you could refuel your ship here if you had a scoop. And that concludes our exploration of the Voodar System. Now, the game featuring this system was more of a "get-back-on-track" game, so it didn't feature a huge amount of action or exploration. Rather, we saw some more utilitarian actions to rebuild the crew and gather supplies. Next time we will follow the robot Caesar on board the S.S. Exodus, and discover the strange place he became stranded! Check it out in The Maps of Interstellar Exports Part V coming soon!